Explore solutions with the team of point of purchase display manufacturers at Frank Lowe. Contact us for custom point of purchase components. For more than 60 years, the Frank Lowe team of expert point of purchase (POP) display manufacturers have been providing innovative point of purchase display components and parts. We'll work closely with you to understand your needs and display goals. 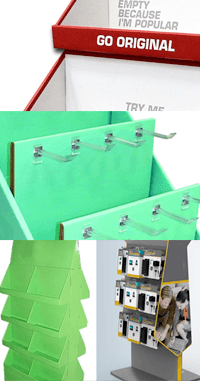 Then, we'll develop custom die cut, fabricated, and laminated point of purchase display solutions that will meet your needs and exceeds your expectations. Our specialized team of point of purchase display manufacturers offer an in depth understanding of the characteristics and features of each of the elastomers we offer. They'll provide assistance and guidance toward the elastomer best suited for your application needs and budget. We offer a wide array of peel and stick products designed for the manufacturing and building of point of purchase displays, signs, and fixtures. Our robust line of fasteners, foam tapes, and surface protectors are also used in the creation of point of purchase displays. We pride ourselves in our range of adhesive options from semi-permanent to removable to high performance industrial strength tapes. We also offer several types of surface protection materials. In addition to the previously mentioned solutions, our production capabilities to die cut, kiss cut, or fabricate peel-and-stick products means we're able to meet any demand. We're able to create an endless list of POP display aids. Explore different solutions and materials that will best meet your display needs. Pursue each option with an unbiased eye and provide intuitive cost-benefit analysis. Create the ideal point of purchase display solution that meets your needs and remains within budget. At Frank Lowe, we will meet your point of purchase display needs — all you have to do is ask! Let’s talk. We’re ready to listen. Contact the premier team of point of purchase display manufacturers at Frank Lowe. Not sure about the exact materials or specs required for your PoP display product applications? Let's chat. We'll help you find the right solution. Are You Using the Right Materials For Your PoP Display Product Application? Let's talk. We'll help you choose the right materials for your PoP display product application.